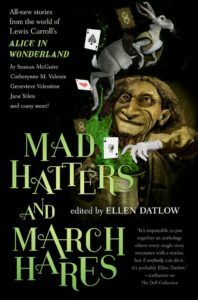 And this new anthology from Ellen Datlow is up for pre-order, Mad Hatters and March Hares: All-New Stories from the World of Lewis Carroll’s Alice in Wonderland. This entry was posted in fairy tales, News and tagged alice in wonderland, Andy Duncan, angela slatter, C.S.E. Cooney, Catherynne M Valente, delia sherman, ellen datlow, Genevieve Valentine, Jane Yolen, Jeffrey Ford, kaaron warren, Kris Dikeman, Mad Hatters and March Hares: All-New Stories from the World of Lewis Carroll's Alice in Wonderland, Matthew Kressel, Priya Sharma, richard bowes, Seanan McGuire, Stephen Graham Jones, tor.com, Ysabeau Wilce. Bookmark the permalink.